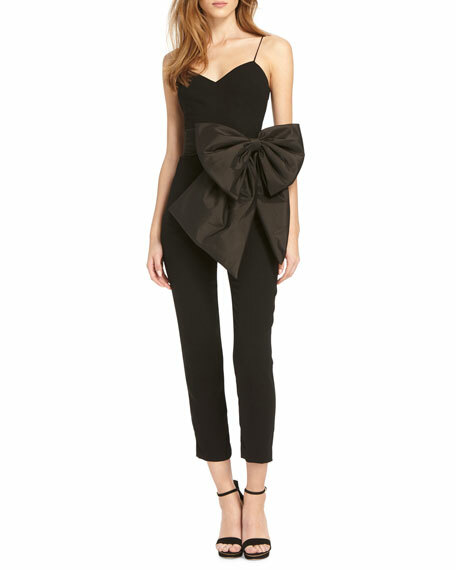 ML Monique Lhuillier jumpsuit with taffeta bow. Approx. 48"L down center back. Fitted bodice; left bow detail. One of the most prominent names in bridal and ready-to-wear, Monique Lhuillier embraces the essence of sophisticated luxury with her feminine collections. After confronting the lack of fashionable options when searching for her own wedding dress, Lhuillier debuted her first bridal collection in 1996. An expansion of her brand soon followed, including the 2002 launch of ML Monique Lhuillier, an eveningwear diffusion line. From signature party dresses and gowns to pretty separates, the allure of fantasy and couture glamor is evident in everything that bears Lhuillier's name.